For many seniors art is a lifelong passion whereas for others, art is a hobby that they never had the time to pursue. No matter what the situation, art therapy contributes to the overall quality of life of your loved one. Art is particularly valuable for seniors with Dementia as it stimulates the brain, stirring the dormant memories. Art therapy can create a sense of accomplishment and purpose for elderly, while also providing them an opportunity to express themselves in a nonverbal way. Also working with a group of seniors, can be a great way to encourage socialization. 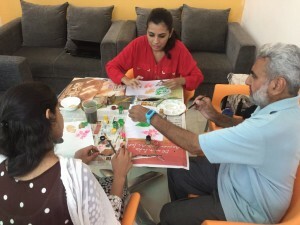 1) Encouraging self-expression – Art therapy is helpful as it enables an individual who has trouble communicating to bypass the language problems and communicate and express themselves through art. 2) Facilitating socialization – Art provides a way to connect with those around you, and can help lessen feelings of loneliness and isolation. 3) Improving cognitive skills and providing intellectual stimulation – Discussing artistic creations with others not only offers a way to communicate, but also promotes intellectual stimulation. Art allows elderly persons to expand their mind and look at things in a way they might not normally consider. 4) Calming people with Dementia – Art therapy is beneficial for older adults living with Dementia as when one uses the creative part of the brain it helps in lowering down the stress level and restores a sense of personal identity. 5) Reducing boredom – Art is a recreational activity and offers a fun and fulfilling way to spend free time. It has proven to be a successful form of therapy even for those who have never picked up art, it reminds them that it is never too late to learn something new. 6) Improving physical/motor skills – Art therapy involves the use of fingers, hands and arms. This light but consistent use of fine motor skills helps improve blood flow and dexterity. 7) Decreasing stress and depression – Engaging in art work gives an opportunity to work through anxiety and negative feelings. The calming nature of painting, drawing, sketching is a way to forget about larger stresses and promotes healthy happy feelings. 1) Painting – Applying paint to paper is one of the purest forms of art and allows you an immense amount of freedom. Being faced with a blank canvas may sound challenging at first, but your art therapist guides you by giving prompts on what you can base your drawing on. With painting you can use bright, vivid colours or muted, darker colours to represent what you are trying to convey. 2) Crayons/chalk – Allowing you to blend and create unique effects, many people like to use crayons and chalk within art therapy. Using crayons in your art work instill happy memories as they often represent experiences from your childhood. 3) Collage Making – Collage is a simple activity that uses magazine photos, digital images or other material gathered from books, pamphlets etc. Art therapist guides you to cut and paste the images together. The collage could be based on a particular theme or could be collecting, arranging and gluing images that catch your attention. It helps you to explore your creative side without having to paint or draw. 4) Photography – This is for those who maybe not very keen to draw or paint as others. These days most smart phones have high quality cameras. You can take pictures based on different themes such as things you are grateful for; people who you love the most etc and can combine the idea to make a collage. 5) Mandala colouring – Colouring is an activity that a lot of people have enjoyed as a hobby during their childhood days. It is considered a good mind exercise as it utilizes both sides of the brain’s cerebral hemisphere. Logic is being used to select a specific color for a pattern or shape in the mandala and creativity is used to combine and pair these colors. Samvedna Senior Care was established in October 2013 with two primary goals – dementia care and active ageing. Our aim is to cater to the intellectual and emotional wellbeing of seniors in Delhi NCR. We help them live happy, active and independent lives, in the comfort of their home and community through interactive caregiving. Our emergency support service is for times when an elderly needs assistance in a hurry. In case of an emergency like a fall, sudden illness or unplanned travel, we are one phone call away, ready to step into action and deal with things. The services include ambulance assistance, an on-call helpline (8am-8pm), hospitalization support and more. Respite care services give caregivers an opportunity to leave home for a few hours for errands, appointments or simply to unwind, with the peace of mind that comes with knowing their loved ones are in capable hands.